Casual doesn't have to mean boring. Here are two key pieces to have in your wardrobe that will jazz up a simple sweater and jeans (wearing gray J Brand jeans here). First let's talk about the faux fur vest. I have a few (I'm sure you're not surprised!) and I wear them constantly...instant chic. Choose a vest that doesn't add a lot of bulk and is easy to wear (nothing fussy like belts or ties). Here's the second "must-have"--it's amazing long necklace with substance. By substance, I mean that it has to have weight (something chunky to balance the vest). This pearl lariat necklace from designer Sandra Willmer is one of my new favorite pieces (find it at Kat's Boutique in Swampscott, MA). I love the suede cord mixed with pearls--it's perfect for dressing up or down. This necklace can be worn so many different ways, but this style happens to be my favorite. Isn't it gorgeous? Complete the look with comfy boots. These Ecco boots are REALLY comfortable...and even better, they're on sale! Great casual, put-together outfit! 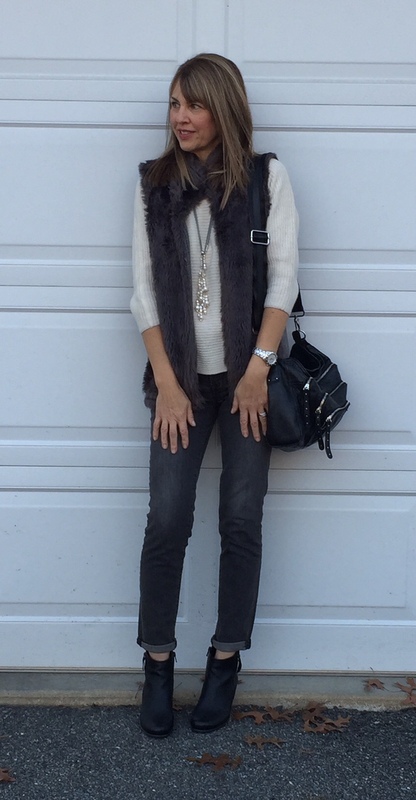 Great vest & the necklace is gorgeous!